The Census at Bethlehem, 1566, by Pieter Bruegel the Elder. 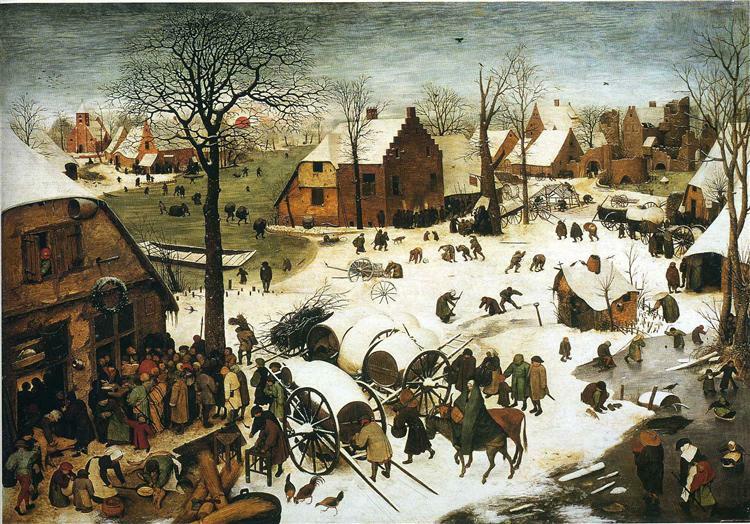 If this looks a little cold even for December in Antwerp, bear in mind that he was painting at the beginning of the Little Ice Age. The ruined castle in the far distance of Bruegel’s painting was based on the towers and gates of Amsterdam. Chaos at the government office… the more things change, the more they stay the same. In the Roman Empire, the natives were frequently revolting. Censuses—with the inevitable taxes that followed—caused rebellion from Gaul to Pannonia to Cappadocia. In Judea one Judas of Galilee led a violent resistance. His group, which Josephus labelled “The Zealots,” preached that God alone was the leader of Israel and urged a tax rebellion against Rome. Citizen and provincial censuses were conducted differently, but that sacrificial bull at the right in the Census Frieze from Altar of Domitius Ahenobarbus (2nd century BC) might give some clue as to why the Jews found the practice so annoying. In 2 Samuel 24, the young King David decided to take a census of his people over the objection of his general, Joab. God was clearly angered by this, but why? The answer may lie in David’s need to number his own strength instead of relying on God. However, a census is often a tool of a totalitarian government, as was certainly true with the Romans. Bruegel painted the actors as his friends and contemporaries, underscoring the universality of the story. But to us, the Flemish Renaissance peasant seems as strange and marvelous as would Biblical-era Bethlehem. Bruegel hid the main actors in his play in plain sight. Now that I’ve shown you the Holy Family, you can find them in the painting. When it comes to artistic representations of the Holy Family’s arrival at Bethlehem, one painting stands above all others: Pieter Bruegel the Elder’s Census at Bethlehem, 1566. As always, Bruegel hid the main figures of the play in plain sight. He subsumed them in the greater action of life, neatly reflecting that the drama at Bethlehem concerned an unknown family at the farthest outposts of the Empire. The players were not exotic; they were the faces of his friends and neighbors. Arrival of the Holy Family in Bethlehem, 1543, Cornelis Massijs. Same schtick, totally different outcome.